Cupid’s arrow is set to strike ‘FGL House’ this Valentine’s Day as the multi-level dining and entertainment destination will host three themed parties, each named after a Florida Georgia Line hit, to suit any relationship status Wednesday (February 14th). ‘FGL House’s main dining room will host the “Life Is a Honeymoon” soiree. The entire delicious ‘FGL House’ menu will be available for purchase, as well as a special “Tell Me How You Like It” prix fixe menu for $50 per couple that offers the choice of one appetizer, two salads and two entrées. Developed by Executive Chef Tomasz Wosiak with TC Restaurant Group/LRC Restaurant Nashville, the “Tell Me How You Like It” menu includes an exclusive Diver Scallop entrée and is also available in Little Red Corvette, the ‘FGL House’ basement lounge, for the “Meant to Be” couples party from 6:00 p.m. until 9:00 p.m. Champagne bottle service will also be offered. A pianist will add the romantic ambiance, and at 9:00 p.m. things will heat up as a DJ takes over to get couples out on the sunken marble dance floor. 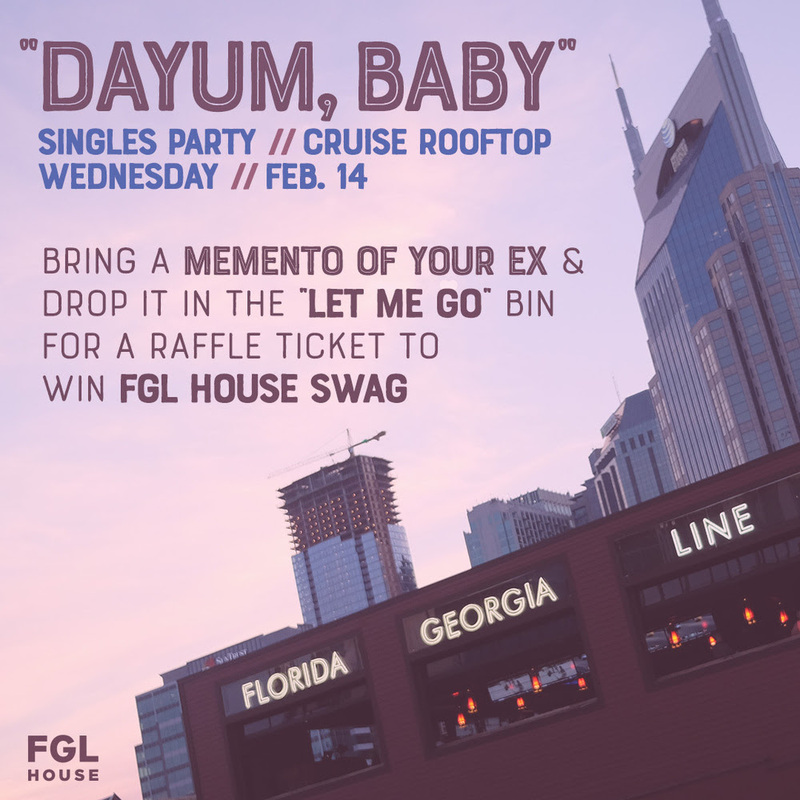 Meanwhile, the Cruise Rooftop…downtown Nashville’s largest… will host the “Dayum, Baby” singles party for those enjoying an unattached Valentine’s Day. Anyone looking to move on from a lost love can drop a memento into the “Let Me Go” bin and be entered to win an FGL HOUSE swag bag. Specialty Valentinis… the Kiss Kiss Cosmo and Cupid Ruby Red Martini…will also be available on all levels. 22,000-square-foot, 4-floor giant reigns 3rd Avenue South in the music mecca of downtown Nashville. Hailed as “one of the finest establishments” (Fox & Friends), keen attention to detail is exemplified in the hand-welded wrought-iron railings, cast-iron instrument chandeliers, reclaimed barn wood walls, and personalized street art mural walls. Fusing delectable Southern cuisine with unique California flair, FGL House’s signature Cajun Fish Tacos were spotlighted in People Magazine, with additional notable looks such as Good Morning America and Us Weekly. Complete with a jumbo video wall, seven bars and two stages, the ultimate entertainment destination boasts the city’s largest “Cruise Rooftop” bar…as seen in a televised performance with FGL and The Chainsmokers during the 2017 CMT Music Awards, and vibey ‘90s-style basement level lounge, Little Red Corvette…which includes a baby grand piano, sunken marble dance floor and infinity ceiling. Dedicated to an all-day and all-night party, FGL HOUSE hosts nightly live music plus “Sundaze Brunch” listed among recurring weekly events. ‘FGL House’ becomes a 21+ venue at 10:00 p.m.
For more information, visit FGLHOUSE.com.